Why Getting Whole Life Coverage Can Be A Good Idea? Whole life is a comprehensive life insurance policy that provides lifetime coverage to the policyholder. Upon the death of the investor, the insurance company makes a payout to the beneficiaries assigned by the policyholder. Whole life coverage also accumulates in cash value over the life of the policy, which the investor can borrow to fund other expenses. In whole life insurance, the rate of premiums remains constant for the entire duration of the policy. While the price of premiums may be more expensive than traditional term life products, this type of policy offers a lot of benefits that do not feature with term life insurance. For starters, the individual in whole life coverage is ensured here for life and will not be left with the nothing, if no claims were made during the time the policy was operational. The guaranteed premiums also ensure that the policy is not affected by market downturns or the rising impact of inflation. This way, your policy becomes cheaper in the long run as the value of money erodes which whole life insurance a lot more affordable. On the other hand term life products are subjected to huge rise in premiums rates when the policy expires after 5, 10, 15 or 25 years. The reasons are usually attributed to prevalent market dynamics, age and overall state of health of the policyholder. 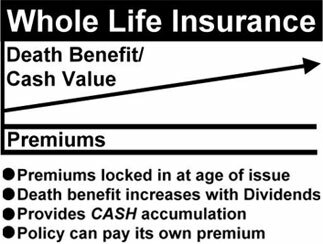 While buying whole life insurance, the company invests a certain sum from your policy to create cash value benefits for the policyholder. This amount accumulates at the guaranteed rate of interest over the life of your policy regardless of the economic climate. It’s similar to many ways a savings bank account where the value of your deposit is enhanced with accumulation of interest. The investor can also borrow from this cash value fund to cover for other routine or urgent expenses. This money can be used to cover your child’s education or pay for emergency treatment costs that may not be covered by your medical insurance. While you do have to pay interest to the insurance company when taking the loan, the rates are often compatible to loans offered by leading banks around the world. The policyholder can also arrange for the loan amount to be deducted from the death benefits package if he or she prefers it that way. Another advantage to whole life coverage is that banks can view the cash value of your policy as collateral. One of the primary benefits that come with whole life coverage is that cash value accumulates with out taxation. Unlike investments in traditional IRA policies where taxes are deferred only until withdrawal, in whole life insurance premiums are paid with after tax dollars. As long as the policyholder’s withdrawals from the whole life policy do not exceed that of what has been put into the insurance, he or she is not generally taxed during payouts. With whole life coverage you can also receive dividends. For instance if you have paid $1000 on your insurance for a year and if the insurance company has been able to earn $100 (10%) on your policy, then insurer might decide to give back $90 to your policy. The remainder of money may be charged as administrative fees and may directed towards their contingency funds. It should be noted that this return on premiums is non-taxable and is also part of the cash value.